The Report Library is a report generation framework for Java. It includes a Swing component to view, edit, and print reports. 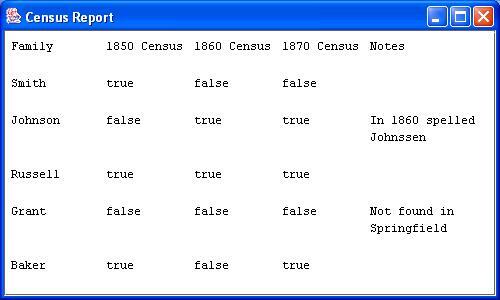 This component, JReportPane, is a cross between Swing’s JTable and JTextPane. It is similar to JTable in its use of objects, renderers, and editors, while it resembles JTextPane in its use of attribute sets, editor kits, and text highlighters. 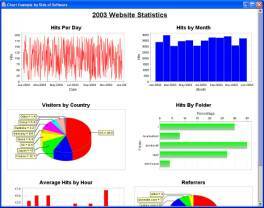 Report – A report is a visualization of an object. It breaks the object into hierarchical elements and associates attributes with each element. These attributes describe visual properties, such as the font, border, and background. Theme – A report theme holds the report’s attributes. The theme is kept separate from the content, making it easy to switch themes at any time. Report Template – A report template generates a report, given the report content and a theme. The library provides a table template that is flexible enough to produce most needed reports. Report Element – A hierarchical portion of the report. The library includes four types of elements: Object, Table, Tier, and Cell. Report Pane – A Swing component that can render a report as a single, continuous view. The report pane also provides methods to break the report into multiple pages. Report Selection Model – A model that controls which elements the user can select in the report pane. Report Editor Model – A model that controls how the user edits the report in the report pane. This tutorial steps you through the creation of a simple report. 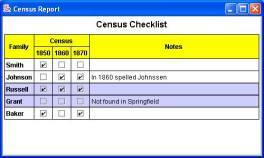 This simple report is a table that lists family names down the left side and censuses across the top. 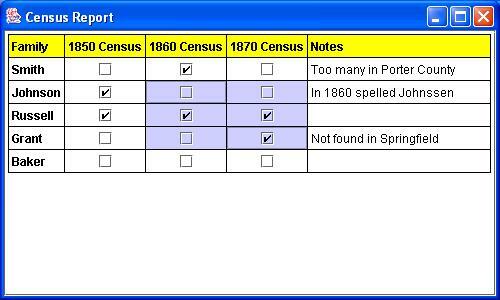 A value of true at a row-column intersection indicates that the family has been found in the census. The last column leaves room for notes. 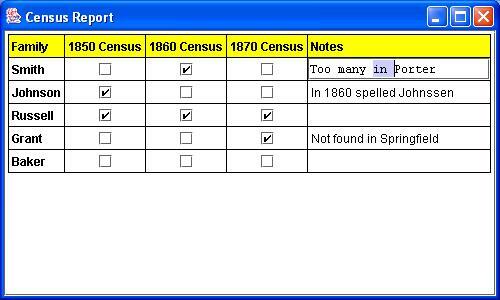 One can imagine this report being useful to a genealogist. TutorialExample3. Formatted, selectable, and editable report. TutorialExample4. Formatted, selectable, and editable report with a title and cell straddling. We choose to store the content in a two-dimensional array so that we can use TableReportTemplate to easily generate a report with a table. If the content is not in the form of an array, list, list model, map, or table model, then we must do some work either to translate our data into one of these forms or to create a custom report template. TableReportTemplate converts the array into a table report. It produces a table element with six row elements, five column elements, and thirty cell elements. Each cell element holds an object element that references a value in our array. It is important that we do not modify the array elsewhere in the application. In the above code, the template uses a default theme that describes the report’s appearance. We will specify a custom theme in a later section. The report pane creates views that are responsible for rendering the report. Since the report may wish to be larger than its container (especially if the window is resized), we place the report pane in a scroll pane. As you can see, it only takes a few lines of code to produce a report. It takes a little more effort to get it to look and behave exactly as desired. In the next section, we spice up the report’s appearance by specifying visual attributes and a theme. Then we allow the user to edit and interact with the report. The appearance of the above report is not terribly exciting because the default theme for TableReportTemplate is empty. That is, it does not specify how the table should look. By explicitly associating visual attributes with the table element, we can improve its appearance. Specifically, we will add grid lines to our table, color the header row yellow, and display the true/false values as checkboxes. Amount to indent the first line of a paragraph. Name of the character font. Text has a line through it. where headerAttributes and tableAttributes are the appropriate header and table attribute sets, respectively. Text is sized so that it fits in its container. The left, right, top, and bottom border coloring. The left, right, top, and bottom border thickness. The coloring of the bottom border. The height of the bottom border. The space after a column. The space before a column. The relative proportion of the excess space that a row or column should assume. The object that converts an object to text. The horizontal alignment of cell contents. The coloring of horizontal grid lines. The height of horizontal grid lines. Element can break horizontally across pages. Element can break vertically across pages. The coloring of the left border. The width of the left border. The minimum number of columns before a page break is allowed. The minimum number of rows before a page break is allowed. The left, right, top, and bottom margin. The object that renders the report data. The layout of a nested report. The coloring of the right border. The width of the right border. The angle of rotation of the rendering (in radians). The space after a row. The space before a row. The appearance of a nested report. The text that appears when the mouse is over the element. The coloring of the top border. The height of the top border. The vertical alignment of cell contents. The coloring of vertical grid lines. The width of vertical grid lines. The minimum number of columns after a page break. The minimum number of rows after a page break. (We recommend using the BackgroundFill attribute, which can handle gradients and multiple colors, instead of StyleConstants.Background.) The following lines of code give our table a grid and a border. to indicate that all but the last column have 0 as their fill proportion. We say more about table attributes and attribute resolution in the following sections. There is a special attribute, TableFormat, that holds the attributes for an entire table. Having attributes grouped together makes it easy to switch to a different table appearance. The table appearance is controlled by the TableFormat interface, which returns attribute sets for a given table, row, column, or cell. The library provides three factory methods defined in TableFormats to simplify the creation of table formats. The first two methods generate a table format given attribute sets for header tiers, body tiers, and footer tiers. Each parameter is an array so the attribute sets are applied in a cyclic fashion. The third factory method creates a table style that is the composition of two other table styles. Another useful class in the library is DefaultTableFormat, which we describe here and use in our tutorial application. DefaultTableFormat implements TableFormat and stores attribute sets for various levels. It allows us to associate attributes with certain parts of a table (for example, Cell 0,3 or Row 5 or Cells in the column header). Once we have created our table format, we must associate it with the report’s table element. The next section describes how a report theme accomplishes this. All report templates are required to provide a default theme. If you choose not to use the default theme, you must supply your own either by defining a class that implements Theme directly or by using DefaultTheme to convert a javax.swing.text.StyleContext into a Theme. The cell in row i, column j. The contents of cell i,j. In summary, we have a report that consists of a hierarchy of elements and a theme. The table element’s attributes are those referred to as “Table” in the theme. This attribute set (in this case a Style) contains a single attribute, TableFormat, which refers to an instance of DefaultTableFormat that has attributes defined for various parts of the table. It is important to understand how the library resolves attributes. The rendering process looks for an attribute in the attribute set associated with the report element. If it does not find the attribute, it looks in the appropriate place in the table format and then checks the parent element’s set. The process continues until it finds the attribute in question. If no attribute set includes the attribute, the default value is used. Let’s examine the resolution order to see why this works. When the library wants to know if it should allow the text “Not found in Springfield” to span multiple lines, it first checks the object element’s attribute set. It discovers that there is no style named “Cell4,4Object” in the theme. Thus, the attribute set associated with the element (Step A) is empty. Steps B – D do not apply since the element is an object element. Similarly, Steps 2 and 3 do not apply. Since the Wrapped attribute is inherited, Step 4 is applicable, and the steps are repeated on the parent element, which in this case is a cell element. The library finds no style named “Cell4,4” in the theme, so Step A does not find the attribute. Step B is applicable, so it searches for the enclosing table format. In the parent table element, it finds our DefaultTableFormat stored with the TableFormat attribute in the style named “Table.” It invokes getCellAttributes on this TableFormat object, passing the cell element in question. Since no attributes have been defined for cells in row 4 or column 4, the table format returns an empty attribute set. Moving to Step 2, the rendering process checks the row containing the cell. Since there is no style named “Row4,” the enclosing table format is consulted via a call to getTierAttributes. Since our DefaultTableFormat does not define the Wrapped attribute for row 4, the resolution continues. Moving to Step 3, it checks the column containing the cell. There is no style named “Column4”, so it invokes getTierAttributes on our DefaultTableFormat. Since column 4 is the last column in the table, the returned attribute set contains the Wrapped attribute. It has the value of true, so the rendering process allows the text to wrap. Now suppose we want to know if the text “Johnson” should wrap. The same logic as before applies, however, when it invokes getTierAttributes on column 0, it finds no Wrapped attribute and continues. It examines the cell’s parent, which is the table element (Step 4). The Wrapped attribute does not appear In the style named “Table” so it consults the table format. The call to getTableAttributes on our DefaultTableElement returns an attribute set that has false for the Wrapped attribute, and the rendering process does not wrap the text. Had we not set this attribute to false, the resolution would have exhausted its possibilities and used the default value of true. We leave it as an exercise to trace the resolution of the other attributes in our example. There are often many ways to achieve the same visual appearance. An object in the report may be rendered as a nested report, with a custom renderer, or as text—in that order of precedence. Rendering as a Nested Report. An object is rendered as a nested report if the ReportTemplate attribute resolves, using the procedure outlined above, to a non-null template. Using this template, a nested report is generated at runtime. The theme it uses is the one defined by the Theme attribute, if any. In a later section, we show how to add a nested report to our example. The renderer must implement ElementRenderer and define the getElementRendererComponent method to return the Swing or AWT component that does the actual painting. In this case, we use an instance of the standard JCheckBox. Rendering as Text. If no template or renderer is found, then the object is rendered as text. The text is gotten by feeding the object into the java.text.Format object associated with the Format attribute. The default Format object simply invokes toString on the object. This is useful for formatting numbers and dates, for example. Reports produced with this library are unique in that they do not have to be read-only. If we install a selection model, the user can interact with the report by selecting elements; if we install an editor model, the user can edit the content. In this section, we enhance our sample application by allowing the user to select rows and cells and by making most of the cells editable. where selectionModel is our desired selection model. The library provides four types of selection models: cell selection, row and column selection, composite selection, and template-based selection. These selection models should meet most applications’ needs. If not, you can create a new selection model by subclassing AbstractSelectionModel or one of these models. This tutorial demonstrates the use of all of these models. Cell Selection. CellReportSelectionModel gives the user the ability to select table cells or the cell content. By default, with this model, the cell content is selectable, rather than the cell itself. In our example, the user cannot distinguish between the cell and the cell content because they occupy the same space. Technically, however, they are different—the cell element is the content’s parent. CellReportSelectionModel gives selection similar to JTable selection. In both the row and column directions, the client can specify multiple-interval, single-interval, or single selection. If we wanted to restrict the user to single selection, for example, we can invoke setSelectionMode(int,int) on both rows and columns. In addition, cells in header and footer tiers are not selectable by default. If we wanted headers to be selectable, we can use setHeaderSelectable(int,boolean). Tier Selection. TierReportSelectionModel gives users the ability to select table rows or columns. Resembling JList selection, this model gives clients the ability to specify multiple-interval, single-interval, or single selection. When you create a tier selection model, you specify either rows or columns. In our example, we enable row selection, which may be useful for the user to insert or delete family names. Since we add cell selection first, it takes precedence over row selection. You can apply a similar technique to add column selection. It is this composite selection model that is installed in the report pane. When the user selects an element in the first column, the row is highlighted. When the user selects other cells, only the cell is highlighted. Cells in the header row, however, are not selectable. Template-Based Selection. The fourth selection model, TemplateReportSelectionModel, chooses a selection model based on the template that was used to create the element being selected. This is useful only if we have nested reports, which we will add in a later section. To respond to changes in the selection, regardless of the selection model, you can register a ReportSelectionListener with the selection model. The editor model controls how the user can edit the report. When the user makes an editing gesture (such as double-clicking or pressing F2), the report pane first asks the report if editing is allowed and then asks the editor model for the appropriate editor. If the report returns true and the editor model returns a non-null editor, then the report pane installs an editor component, and editing begins. The editor component may be any AWT or Swing component. where editorModel is our desired model. The library provides three types of editor models: editing based on class type, editing based on row or column index, and template-based editing. If these predefined models do not suit your needs, you can create a new editor model by subclassing AbstractReportEditorModel or one of these models. Class-Based Editor Model. The DefaultReportEditorModel class maps class names to editors. When asked for an editor, the model chooses the editor (if any) associated with the class of the object being rendered. Tier Editor Model. The second editor model, TierReportEditorModel, associates rows and columns with editors. When asked for an editor, the model chooses the editor (if any) associated with the row or column containing the object being rendered. By default, objects in header or footer tiers are not editable. To change this, use setHeaderEditable and setFooterEditable. Template-Based Editor Model. Finally, TemplateReportEditorModel, like its related selection model, delegates to an editor model (if any) associated with the template that created the element in question. This is useful only with nested reports. In our example, we want to use a check box to edit the Boolean cells and a text field to edit the notes. Since the Boolean cells appear in columns 1, 2, and 3 and the notes appear in column 4, we can use an instance of TierReportEditorModel to map column indices to editors. We center the checkbox and make it transparent so that it matches our custom checkbox renderer. After the user edits a value in the report, the new value is saved in our array. This allows us to access the updated data later, if we need to. If we need to take an action as soon as the value is set, we should use a TableModel that implements setValueAt instead of an array to hold the data. In the previous section, we enhanced the report pane by specifying a selection model and editor model. In this section, we enhance the report further by adding a title and by merging cells. where bodyTemplate and bodyTheme are our original template and theme we created in the first three versions. We again store the attributes in a theme. This time, however, instead of using a table format to control the appearance of the table, we follow the naming convention described above. For the title, we create a style named “Cell0,0Object.” This style includes attributes to make the title larger, bold, and centered. For the body, we create a style named “Cell1,0Object” and define the report template and theme. Since we now have a nested report, we must adjust our selection and editor models. Recall that TemplateReportSelectionModel chooses a selection model based on the name of the template used to create the report element that the report pane is trying to select. In our example, we do not want the user to be able to select any part of the outer table. Only the cells and rows of the nested table are selectable. Thus, we use a TemplateReportSelectionModel to register our original selection model with the template name “Census Template.” This name was provided in the constructor of TableReportTemplate. Tables can support cell straddling, or merged cells. In other words, a cell can span multiple rows and/or columns. The class TableReportTemplate handles cell straddling by allowing the data model to return a sentinel value to indicate if a cell belongs to the cell of the preview row or column. Specifically, when the data model returns the constant TableReportTemplate.STRADDLE_PREVIOUS_COLUMN for the value at row i, column j, the template recognizes that the cell element at row i, column j-1 should occupy this space as well. Similarly, when the data model returns the constant TableReportTemplate.STRADDLE_PREVIOUS_ROW, the template ensures that the cell in the previous row covers multiple rows. 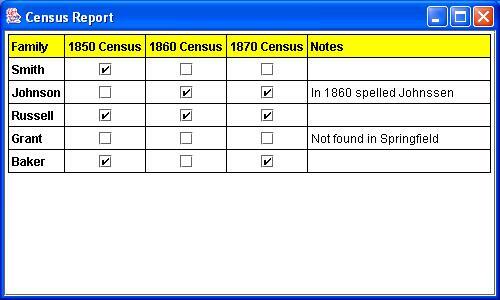 In our example, we want to move the word “Census,” which is common to the header of three of the columns, to a header row of its own. With the addition of a new header row, we must inform the table template that there are two header rows instead of one. In addition, we must change the way the header rows are colored. Row coloring does not suffice if cells span multiple rows and there are horizontal grid lines or space between the rows. We actually want to color the entire cell yellow. The following topics are not illustrated in our simple example, but they are useful. to acquire a java.awt.print.Pageable object that has broken the report into a number of pages. All pages must be the same size. The first two methods scale the report so that it fits in the width of the page (if possible), while the latter two do no scaling. The second and fourth methods allow you to specify page headers, page footers, and watermark images. Once you have the Pageable object, you can pass it to the standard print framework for printing. 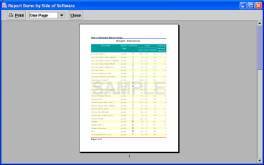 The Report Library does not include the ability to preview pages before printing them; however, the Print Preview Library, which is sold separately, can be used for this purpose. For more information, see the Print Preview Library’s homepage. Throughout these web pages, you will find a number of sample reports. The following table provides a list of the examples and links to the source code.